Orlando, FL- Late this afternoon, the State’s Attorney’s Office notified Jose Baez, attorney for tot mom Casey Anthony, they intend to seek the death penalty. Prior to Caylee Marie Anthony’s remains found on December 11. 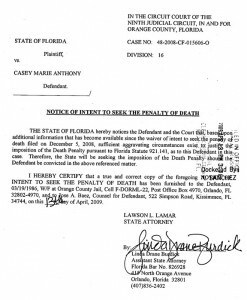 2008, the state had decided not to seek the death penalty 6 days earlier. In the state of Florida, the legal aggravating circumstances that would apply in this case would be that the murder was cruel and atrocious and cold, calculated and premeditated. The decision of the prosecution to reverse it’s original stance in their murder indictment against Casey Anthony for the death of her 34 month old daughter Caylee, is the latest in what seemed like rapid fire developments over the Holiday weekend. Jose Baez is not a death penalty qualified attorney and he cannot defend this case without one. Orlando, FL – Keith Williams, the “reporter” named in the August 18, 2008 Police Report as the finder of a Father’s Day balloon, bag full of stuffed animals and small girl’s clothing, including, a sandal, provides the latest bombshell development in the case against Casey Anthony. In an exclusive interview to Blink On Crime, we may learn why Jose Baez deposed Officer Richard Cain, the responding officer to both Keith Williams and Roy Kronk calls for findings at the scene within twenty yards of the vicinity where 34 month old Caylee Anthony’s remains were ultimately recovered. I have decided to transcribe parts of my interview, so you, the readers, can judge for yourself without my interpretation of Keith’s comments. about the find and his information there was more out there. She stated that they had three private investigators working on it and were confident that Caylee was alive, and that none of the items in the bag belonged to Caylee so it was doubtful anything at the scene was. Orlando, FL- Keith Williams, the “reporter” named in the August 18, 2008 Police Report as the finder of a Father’s Day balloon, bag full of stuffed animals and small girl’s clothing, including, a sandal, provides the latest bombshell development in the case against Casey Anthony. In an exclusive interview to Blink On Crime, we may learn why Jose Baez deposed Officer Richard Cain, the responding officer to both Keith Williams and Roy Kronk calls for findings at the scene within twenty yards of the vicinity where 34 month old Caylee Anthony’s remains were ultimately recovered. Keith Williams, currently working in the security industry and former massage therapist, grew up down the street from Casey Anthony and owned the home at 8735 Grandee Drive up until five years ago. After some self-admitted life lessons he has “learned the hard way,” he returned to Orlando two years ago. He initially heard of Caylee Anthony’s disappearance following Casey Anthony’s arrest, he has felt a strong connection to find Caylee and that based on his younger sister’s friendship accounts with Casey, he was positive she was in the woods by Hidden Oaks elementary school. He first went to the woods in late July or early August to the best of his recollection, possibly early August after a conversation with his younger sister Alison. He did not venture into the woods at that point; he did run into a reporter which he spoke to, but declined to appear on camera, but shared he was a childhood friend of Casey’s and familiar with the area in the woods as most neighborhood kids were. He stated it was a place they would sneak off to or in some cases bury their pets. 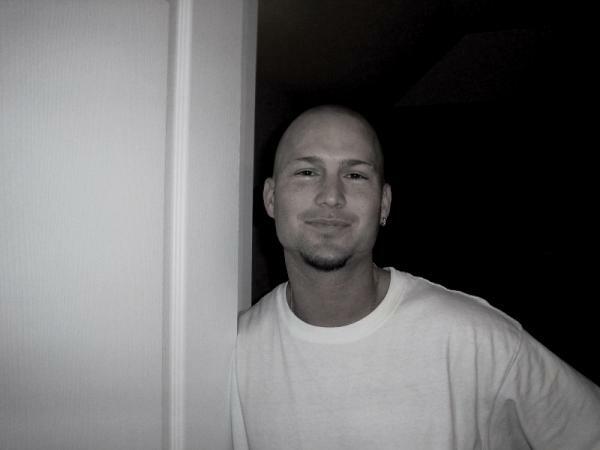 Prior to August 18, 2008 Keith had not had any conversations with George or Cindy Anthony regarding Casey or Caylee and had not seen them in years.